Nyasanda Scout Troop Proudly wears their new uniforms. This news is over a year old but did you know that the 24th Kitchener Group sent $500. 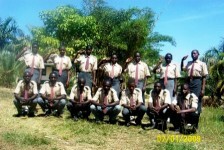 to the Nyasanda Scout Troop in Ugunja, Kenya so that they could have uniforms. The Troops new uniforms were made in their local community.